Hello lovebirds! 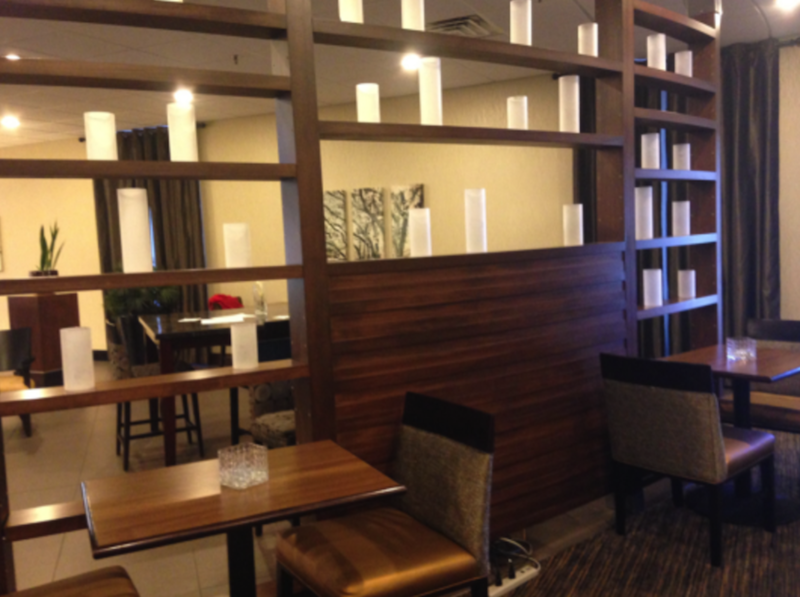 Today, we’re taking a look at the Harvest Grille and Bistro, located inside the Hillsborough Street Doubletree hotel. As it turns out, most people don’t seem to be aware that there is a restaurant inside the Doubletree, but apparently, there are two. The hotel boasts a venue for breakfasts, and another for lunch and dinner. I went to the latter and found myself greeted by Cally Valencia, the Director of food and beverage, and Erica, a member of the waitstaff, who I sat down with and spoke with about the place. The Doubletree is offering a special deal on rooms this Valentine’s day with their Romance Package. If you book a room with them for you and your sweetheart, you’ll get complimentary chocolate-covered strawberries and a bottle of champagne, and you’ll have an option for a late checkout in case you have a long night. 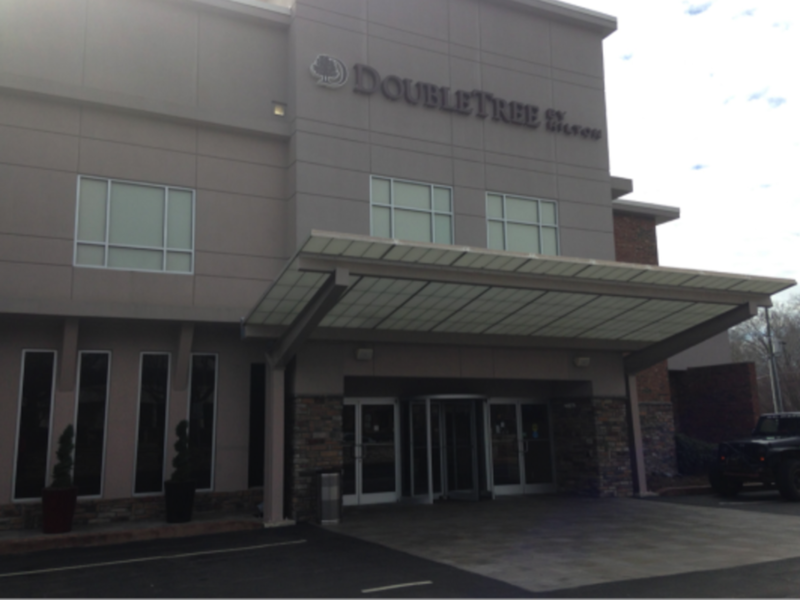 The location itself has been there for about 50 years, though it’s been a Doubletree for only about five. Before that, it was a Brownstone hotel, and back in the 70s, the basement was a nightclub. Today, it’s a very modern, comfy space that really has aged well. The nightclub basement has even been converted into banquet space that can fit about 500 people between their two halls. The interior itself is very modern and chic, as expected from the Hilton brand. The restaurant has a small bar, flanked with TVs, a small water feature, and plenty of space to cuddle up with your sweetie-pie while you enjoy a romantic meal together. As for the restaurant, I decided to ask Erica about what she thinks is unique about their location. 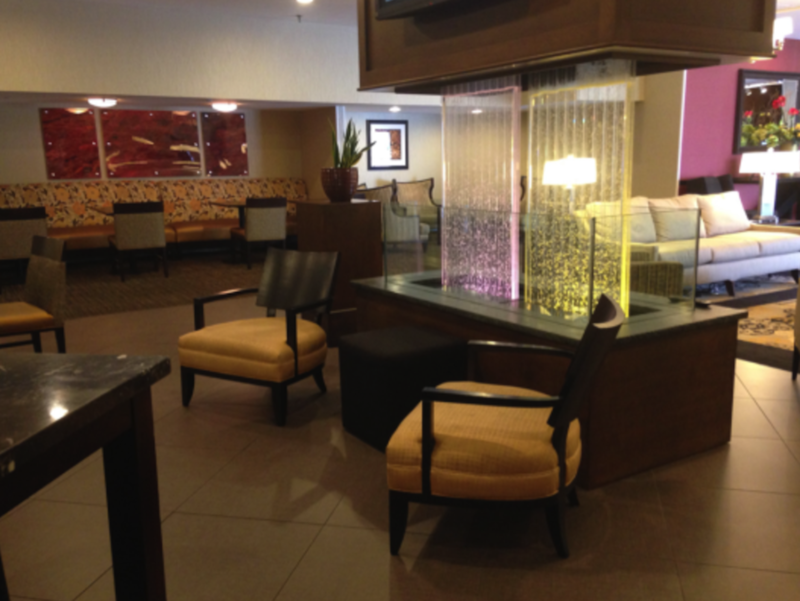 “Our staff is friendlier.” She said, “We treat our guests like family.” And in my experience that’s definitely true! Both Cally and Erica were very open and honest with me during my visit, and made sure that all my questions were answered, especially about what the food was like. The menu is small, but offers a lot of up-classed hotel faire. Burgers, salads and soups, and even pizza. I asked Erica what she eats here, and she said she loves their pizza and steaks, and can even recommend their salads, despite not being much of a salad person herself. 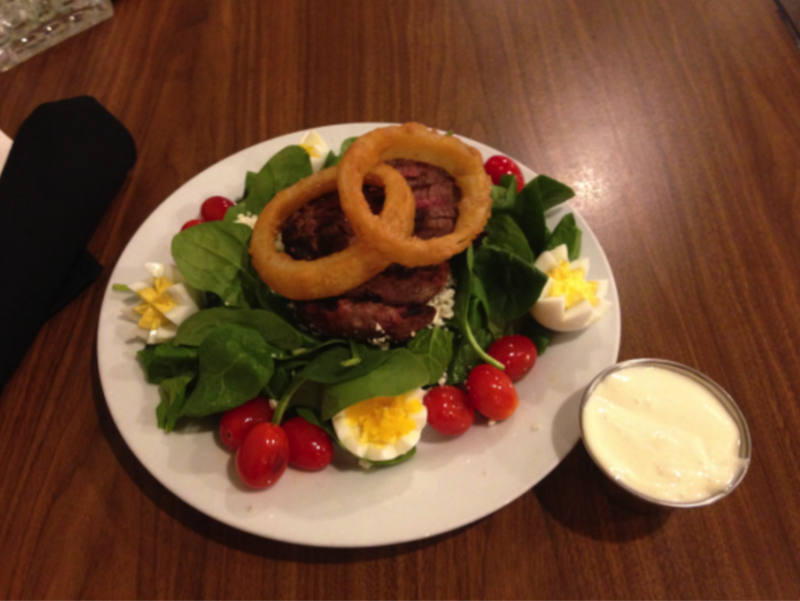 She suggested to me one of their best sellers, the steak and bleu cheese spinach salad. I took her up on her offer, and I wasn’t disappointed. The plate had a pile of fresh, vibrant spinach topped with crumbled bleu cheese, perfectly cooked-to-order steak, and two golden, freshly-fried onion rings perched on top. The edge of the plate had decoratively-cut hard boiled eggs and grilled cherry tomatoes arranged around the outside. It was a feast for the eyes, and a feast for my stomach too! I was really thrilled with the meal. It was delicious, and that was made all the better by the friendliness of the staff, the comfy chairs, and quiet interior. It’s a slightly hidden gem on Hillsborough street, tucked away waiting for you and your darling to discover it this Valentine’s Day.